Whether you’ve just been outside shoveling the driveway, walking home through freezing temperatures, digging yourself out of a snow bank – or whether you’re inside watching others do all the heavy lifting – it’s all worth it once you finally get to curl up in a cozy armchair with your fingers wrapped around a mug of steaming hot chocolate. If you’re trying to lose weight, than this milky, creamy, sweet chocolaty beverage — free of milk, fatty cream and unhealthy sweeteners — is for you. An added scoop of SLIMQUICK Pure Double Chocolate Protein powder gives this brew a shot of lean muscle-building fat-burning power, while coconut milk endows it with healthy medium-chained fatty acids that strengthen the immune system and are less likely to be stored as fat inside your body. Using stevia instead of refined sugar and other unhealthy sweeteners also lowers the calorie count even further, decreasing gulper’s guilt and maximizing pamper-me pleasure. 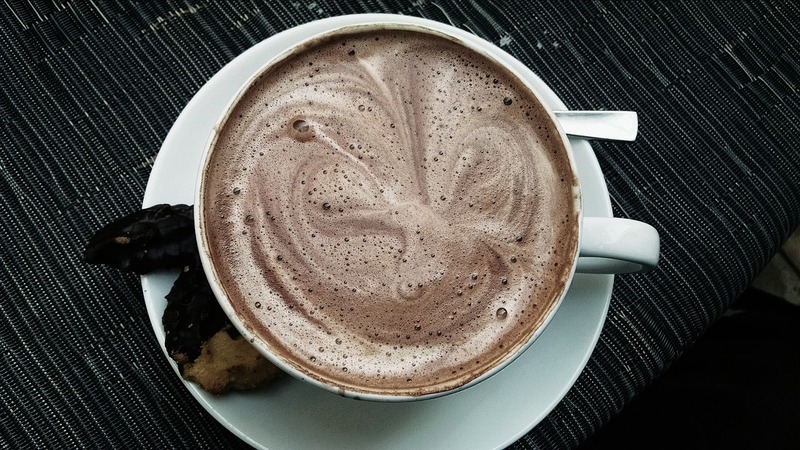 Try this high-protein hot chocolate recipe as-is or experiment with optional add-ins: you can try a pinch of dried chili flakes, cayenne pepper or hot sauce for a kick of heat, or a dash of cinnamon or nutmeg for more earthiness, or a few drops of pure peppermint extract for a minty twist, or a sprinkle of dark chocolate shavings for more depth, or even a teaspoon of natural peanut butter or cashew butter for richness and creaminess. Optional Add-Ins: pure peppermint extract, cinnamon, nutmeg, cayenne pepper, chili flakes, dark chocolate shavings, peanut butter, cashew butter, etc. In a sauce pan, heat the coconut milk over medium heat until it is hot (but don’t allow it to reach boiling). Stir in all of the other ingredients, continuing to stir until it all dissolves and has a smooth consistency. Pour in to a mug, curl up and enjoy!